In the spirit of Amy Krouse Rosenthal’s work, 18 bloggers set out to “Plant a Kiss” in the world on April 29. We each did something we thought would spread a little extra joy, color, connection, poetry, or magic in the world. Then we watched to see what would happen! Today all of us are posting about that experience. My thoughts are below; visit http://www.simplycelebrate.net/plant-a-kiss-day-2013 to find links to all of the participating bloggers and hop around to see how each was uniquely inspired to celebrate Plant a Kiss Day. 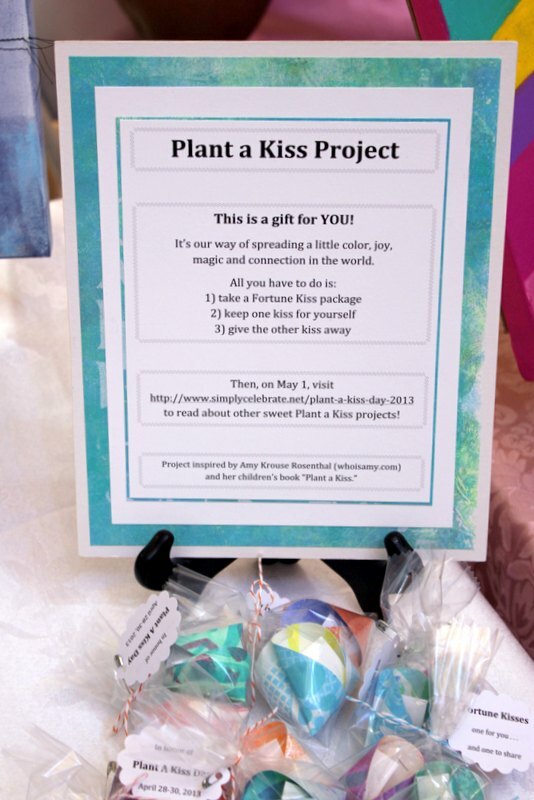 The Plant a Kiss project has been near and dear to my heart since its inception in 2012; but, well before it was even a twinkle in anybody’s eye, I’ve loved seeing creative acts of kindness. I’ve come to believe that when we find ways to be kind to each other it sort of squishes out the space available to negativity. I think there’s power in that and I’ve made it part of my life’s mission – big things where possible (like Bubble Flash Mobs and Fortune Kisses) and little, everyday kinds of things everywhere else (like letting someone merge in traffic or offering a helping hand to someone who needs it). My project this year was sort of a round 2 version of the project I did last year for Plant a Kiss day. I used hand-printed papers to make little paper fortune cookies, filling each with an inspirational quote, then packaging two together so the recipient can keep one and share the other. Last year I handed out my packages anonymously (left them and ran :D) but this year, I ended up handing them out personally and it was a whole new experience! I have to admit that there have been times since I started all this that doubt has made me question whether I could possibly have any real or lasting impact, but that was before I met Koyen Shah. Koyen is the director of a girl’s school in Ohio and she contacted me earlier this year. She’d seen my Fortune Kiss idea online and was interested in using my design to kickoff a leadership program for her 4th grade students. I got to Skype with the girls one day in February to talk about the Plant a Kiss project and help them get started making Fortune Kisses. I’ve since learned that the girls took the project and ran with it to bake cupcakes, sing songs, distribute flowers and I have been completely blown away by them. I always thought (hoped) my project had the potential to grow beyond me and the recipient, but to have it go even beyond the packages I handed out was more than I’d really thought possible. After working with the girls, I felt inspired to take my project up a notch. One of the things I shared with the girls was how intimidated I’d been to actually “hand” the packages to a person. I decided to challenge myself this year to do just that and I had to start with my local paper arts store, My Heart’s Fancy. This place and the folks that “live” there have become a second family for me; encouraging me, cheering me on and really giving me a place to be who I am – not just the owner, Maura, and her creative director, Lisa, but the customers too. I’ve felt embraced there and wanted to give something of that feeling back. 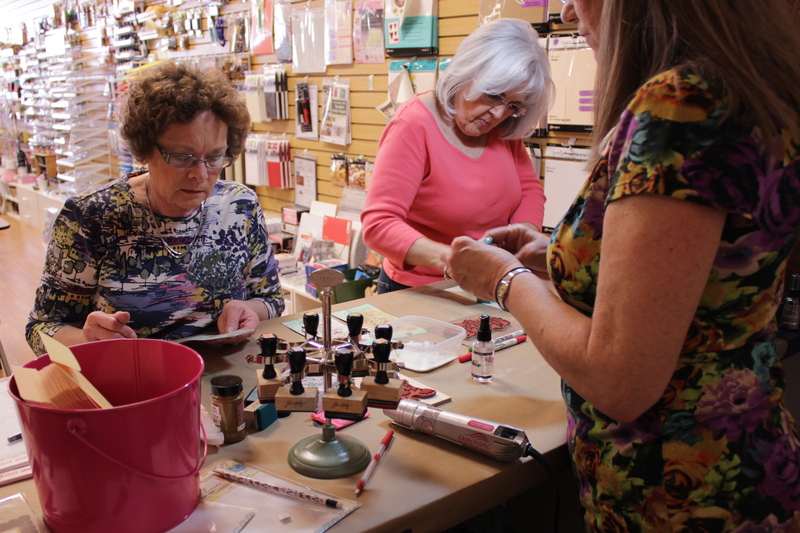 Each month, Maura and Lisa host a Demo Day, where everyone comes by to visit, shop and make a little project to take home. 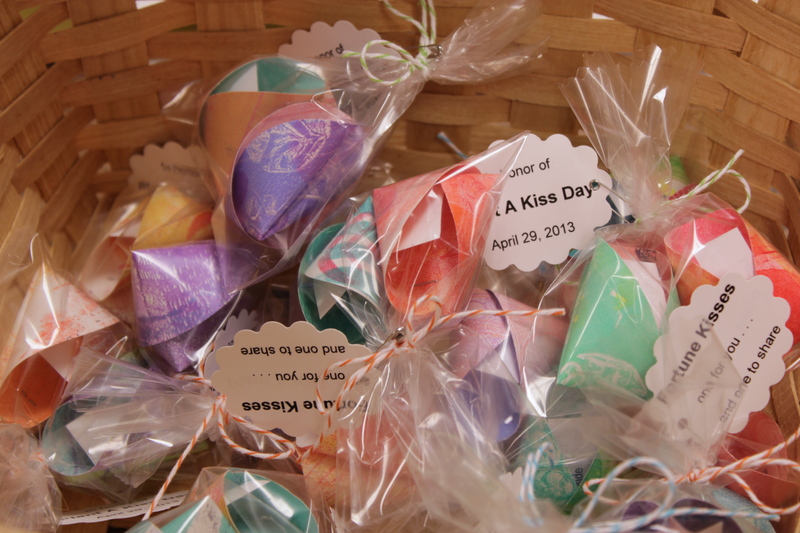 I was on hand April 20 to give away about 50 Fortune Kiss packages. The reactions varied from surprise to curiosity, some people were especially moved and took the time to chat with me or read Amy’s book, which I had with me. 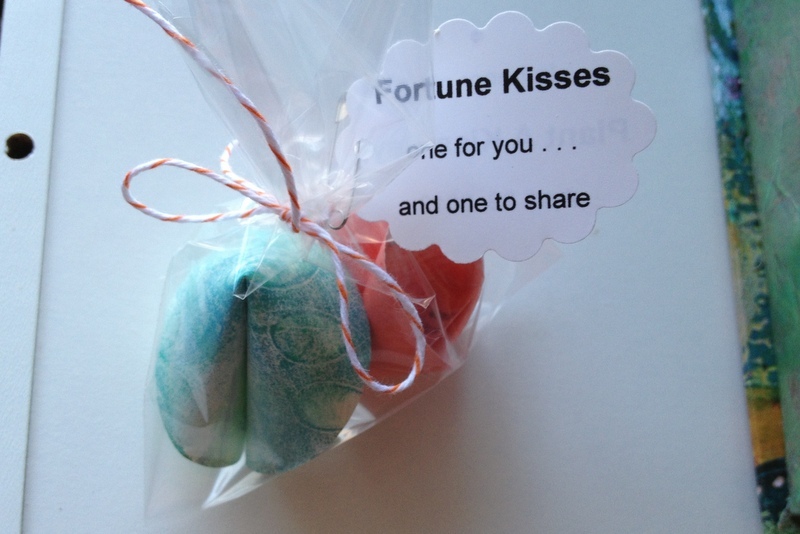 One woman planned to share her extra kiss with a friend who’d experienced a family loss. I was so moved by that and by the whole day – it just filled me to the brim. But, I still wanted to do something more. 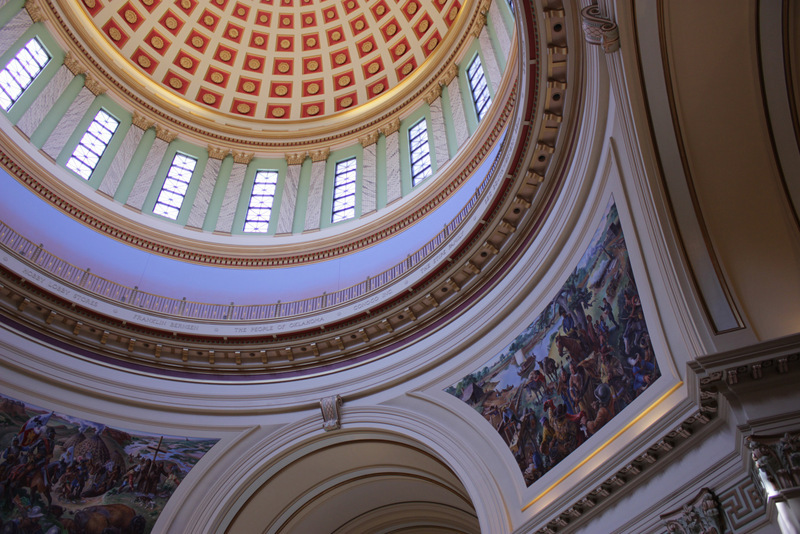 I’d been invited earlier in the year to participate in a Breast Cancer Awareness event at the Oklahoma State Capitol on April 30. This event is dedicated to breast cancer survivors, their families and friends, and anyone interested in saving lives from this horrible disease. I have not been directly affected by Breast Cancer, but I am a firm supporter of awareness and early detection, so was especially honored to be invited to share my artwork. I also saw this event as a perfect opportunity to spread a little kindness among a group that particularly needed it. The reception I received was amazing! I gave away another 75 packages in under 3 hours and was so inspired by everyone I met – the women who organized the event, the people who donated time, the other artists who shared their work. It was one of the most rewarding experiences I’ve had in quite some time! From the beginning, my biggest wish for this project has been to see it grow – by planting kisses in packages of two and by providing instructions so people could make their own. What I never even thought to hope for was the connection I’ve experienced this year – from placing a package of kisses into a grateful palm, to connecting with (and being infected by) the excitement of a group of aspiring kiss planters, to the potential positive impact my small gift might have had on a group of people who’ve struggled and overcome great odds. I was stretched beyond my limits this year, having to look people in the eye; in some cases, hold hands and point the way. I realized that we sometimes isolate ourselves to the point that we can’t see when someone is reaching out to us – we can’t comprehend when a gift is in front of us and truly meant for us to accept and enjoy. I took a great deal of joy in helping people understand that this year – and I started to learn it a little myself too. Thank you Laurie – it feels so wonderful to be seen and understood in this. Sending you hugs! That’s been one of my favorite parts too – the idea that the second kiss might find its way into someone else’s hands or that the tutorial will inspire some unknown someone out in the world to spread a little magic of their own. Thank you, thank you for all your support and, I agree, let’s definitely keep doing this!!! you, my friend, are amazing. just imagine the ripples this will create! imagine! Ripples – oh my, YES, that is definitely at the heart of this dream! !